It is a fact that Allied Headquarters in the SWPA continually overestimated the capability of the Japanese to combat our forward excursions, especially in The Philippines Campaign. Obviously, it is better to overestimate than underestimate, but enormous efforts were expended in planning for invasions that never happened and in building facilities that were never used or only briefly. We told you at Boston and in the December (#21) FLYING CIRCUS of Operations GOSSIPMONGER, KING I, KING III, LOVE II, and MIKE II, which were cancelled, and KING II, Leyte, and LOVE III, Mindoro, which were much advanced in time. 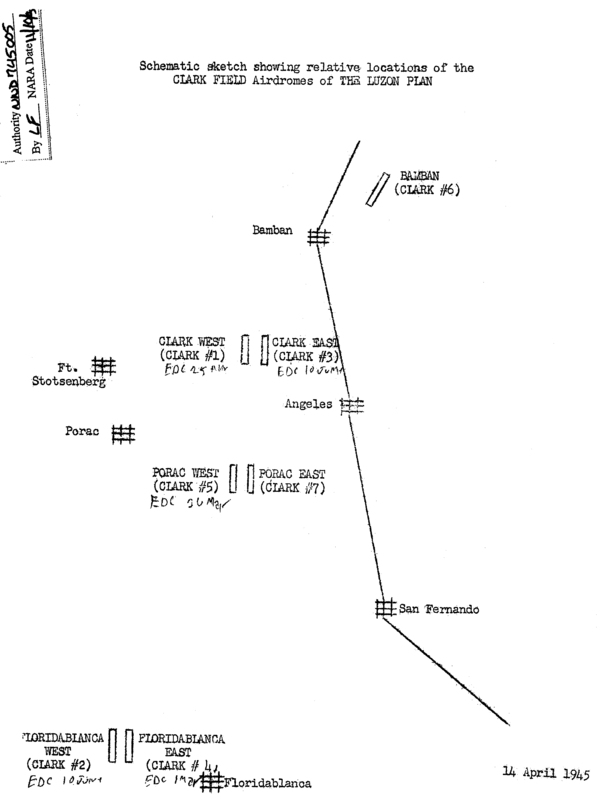 Another project abandoned after much effort was the LUZON PLAN to concentrate the Allied aerial armada in a vastly expanded Clark Field complex on the Luzon plain between Linguyan and Manila. The 380th was heavily involved in this as a cadre of our personnel were detailed there and a large part of our service equipment was mistakenly sent there. The following presents a sketch map of the major airfield construction to be done and the units to be assigned, including the 380th. The construction was delayed and the war moved too fast, so the project was finally cancelled. 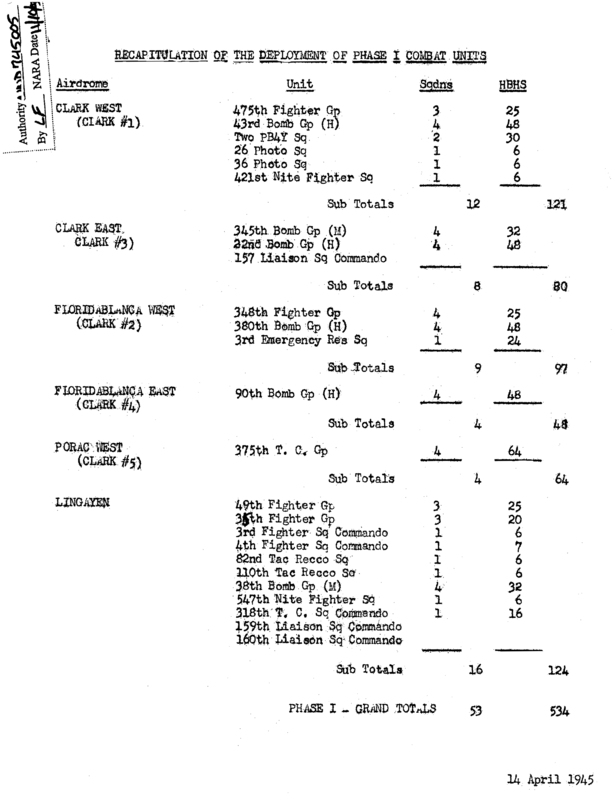 Note the assignment of the 380th to FLORIDA BLANCA WEST (CLARK #2), and the 90th to Florida Blanca East (CLARK #4). The 43rd (from Leyte) and the 22nd (from Samar) finally moved to Clark West (CLARK #1) and Clark East (CLARK #3), respectively, but as we all know, neither the 90th nor the 380th moved to Florida Blanca. All the other heavy groups transferred to Okinawa in July with the 380th last to go there (mid-August). So we were last to The Philippines and last to Okinawa. Apparently the others all had combat missions over Japan before the Armistice on August 15th. We arrived after that date and only had reconnaissance and weather missions to fly.